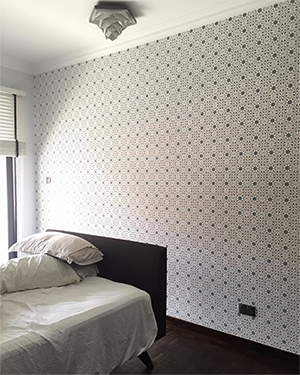 Look at this elegant and timeless makeover of customer’s bedroom with our `Peranakan Tile’ wallpaper! The wallpaper turns the bedroom space into a classy and at the same time cosy place for resting. It’s almost coming back to a hotel room every day. Interior designs in Singapore homes nowadays have reached a level where wall finishing is more and more prioritised aesthetically. Wallpaper is a natural choice as it comes in wide variety of design. Home owners are beginning to embrace wallpaper with pattern designs for a stunning, hotel-like effect. Onlewo’s range of wallpaper designs is inspired by Singapore culture and heritage and comes in widely varying expression and colour options. There are iconic patterns like `Chinatown’, `Little India’ and `Tiong Bahru’ which gives a distinctive Singapore impression. You will be able to find these iconic patterns in bold, dramatic colours and apply them as statement designs, or in soft, subtle tone-on-tone colors for a quieter design that is elegant and yet rich in details. Softer and more feminine wallpaper design can be found in our popular `Peranakan Bliss’ range. The flowing Phoenix pattern intermixed with floral and butterfly elements is very suitable for bedrooms. It creates a dreamy, blissful mood, whether in gentle colours tones like beige with carefully placed splashes of bright colours, or white with varying tones of blue. Our designs also include unique patterns like the `HDB’, `Cengkir’ series which are used to good highlighting effects. They add a dash of colour and lively detail to areas like columns, foyer, feature wall, etc. Our customer who installed `Peranakan Tile’ wallpaper in her room in the example above successful made a feature on one of her room walls. Onlewo’s wallpaper designs are original works which will give your home, office or restaurant interior a totally unique and timelessly charming look.